Under the 2015-2017 Medium-Term Environmental Effort Plan, Dai-ichi Life's executive officers and employees are together steadily carrying out environmental preservation efforts.The plan incorporates numerical targets and qualitative targets based on indicators including Efforts to Prevent Global Warming (Energy Saving), Efforts to Build a Recyclable Society (Resource Saving), Corporate Efforts for Environmental Protection, and Efforts to Improve Environmental Management in Response to Social Demands. It also establishes long-term targets for its Energy Saving component that span until fiscal 2030. To promote sustainable environmental improvements, the President and Representative Director has been appointed as the chief executive of the company's environmental initiatives. 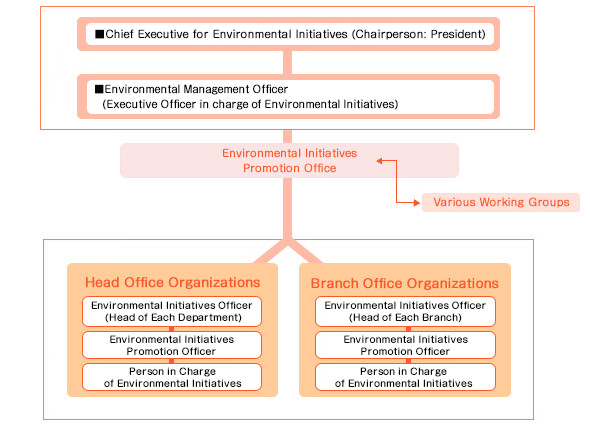 The Environmental Management Officer appointed by the president considers important matters such as environmental initiatives policies, action plans, details of activities and allocation of resources on a company-wide scale. Further, to ensure the environmental initiatives take root across the company, the Environmental Initiatives Promotion Office coordinates with related working groups to promote the company-wide implementation of various measures. Environmental CSA (control self-assessment) has been adopted throughout the Company. Environmental audits are regularly conducted for each department in accordance with our unique criteria and we implement the PDCA (plan-do-check-action) cycle for risk reduction and business improvement.